Doris C. Kempner, with her tremendous respect for family therapy as a vehicle for helping families, has been a valued member of the Ackerman community since 1996, when she joined the Board of Directors. 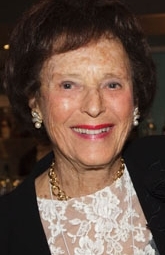 Her association with Ackerman quickly became a family affair when the Kempner Lecture Series was established in honor of her late husband, Carl, who was a cancer survivor. A close friend endowed a lecture series in Carl’s name to provide funding to an aspiring student or faculty member doing work in the area of family therapy and chronic or life threatening illness. It was Dorie’s special interest in families and health that drew her to support Ackerman’s Center for Families and Health, which helps families address the impact of chronic and/or life-shortening illness on marital, parent/child, and intergenerational relationships. She has been instrumental in helping Ackerman move forward in innovative ways to help families cope when medical illness strikes. She holds two advanced degrees – a Masters of Social Work from NYU School of Social Work and a Master of Science in Education from the Bank Street College of Education.